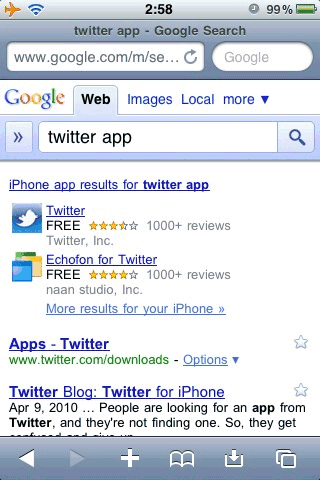 Sometimes, when you use a smartphone, the best search result is not a web page, it's an application. That's probably the reason why Google added an OneBox for iPhone and Android apps. If you enter a query that includes keywords like "download", "application" or "app" on an iPhone or on an Android phone, you'll see a list of results from Apple's App Store or from the Android Market. "You can tap these links to go directly to the app's Android Market or iPhone App Store page. You can also get a quick look at some of the app's basic details including the price, rating, and publisher. These results will appear when your search pertains to a mobile application and relevant, well-rated apps are found," explains Google. Maybe Google will develop a full-fledged search engine for mobile apps, index reviews, show recommendations and allow developers to advertise their applications. It will be interesting to see how this affects our click through rates for applications. Particularly as it will bypass any official pages and go straight to the app store. Dear Google, PLEASE let me edit Google Docs on my iPad! Please. Google is my favourite browser and I love to use it instead of any other browser. I have bought an iPhone just some days ago and I am surfing on the Internet from it and it is running very nicely. I hope this new feature will also serves good.